Teochew cuisine, also known as Chiuchow cuisine, Chaozhou cuisine or Chaoshan cuisine, originated from the Chaoshan region in the east of Guangdong province, which includes the cities of Chaozhou, Shantou and Jieyang. Teochew cuisine bears more similarities to that of Fujian cuisine, with which it shares some dishes. This may be due to the similarity of Chaoshan’s and Fujian’s culture and language and to their geographic proximity. However, Teochew cuisine is also influenced by Cantonese cuisine in its style and technique. Many people of Chaoshan origin, also known as Teochiu or Teochew people, have settled in Southeast Asia, especially Hong Kong, Cambodia, Malaysia, Singapore, Thailand, and Vietnam; influences they bring can be noted in the cuisine of Singapore and that of other settlements. A large number of Teochew people have also settled in Taiwan, evident in Taiwanese cuisine. Below are the notable Teochew dishes we had. 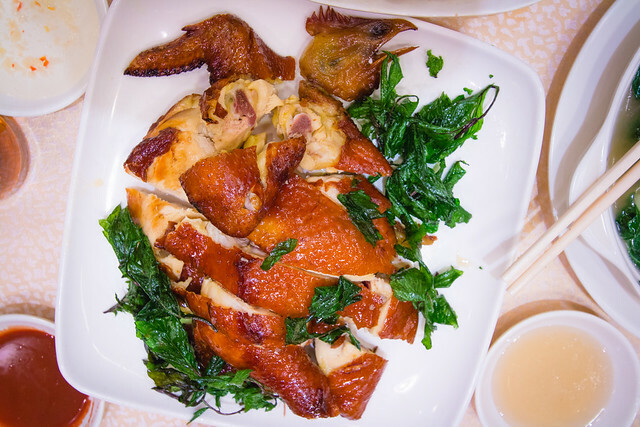 Steamed/roasted goose is a famous Teochew dish. The Chinese name of the goose dish, dissected, tells you more about the dish. 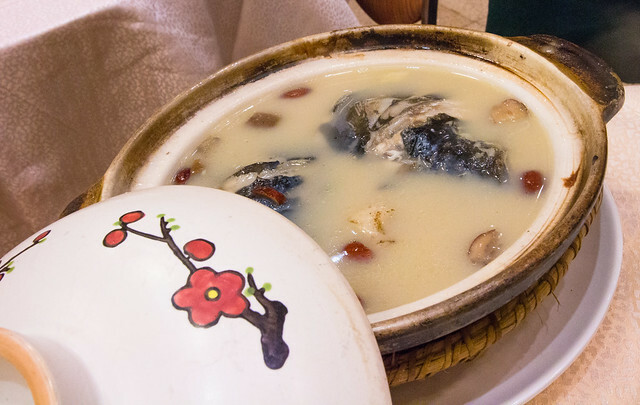 鹵水 means ‘master stock’, a type of stock used to braise or poach meat. 鵝 is goose. 片 means piece. So, all the characters put together becomes ‘pieces of goose in master stock’. 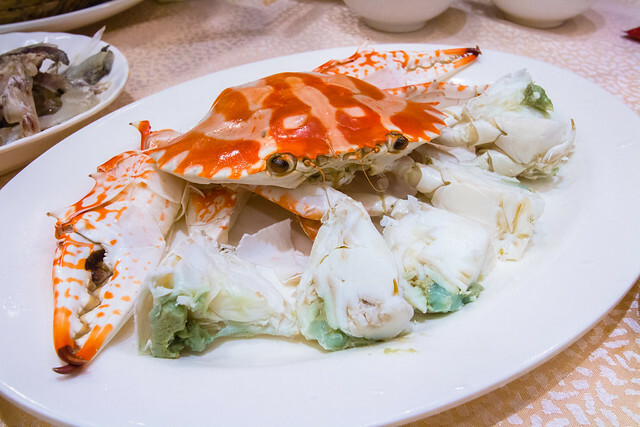 Cold crab is a classic Teochew dish. The legs of the crab is cut from the body, poached, then chilled. The crab is usually served with a dipping sauce. The Chinese name literally translates to ‘Chaozhou frozen crab’. I’m finding that oyster omelette/pancakes are in almost every Asian country’s menu! You may be familiar with the Korean oyster/seafood pajeon, and/or the Taiwanese oyster omelette. 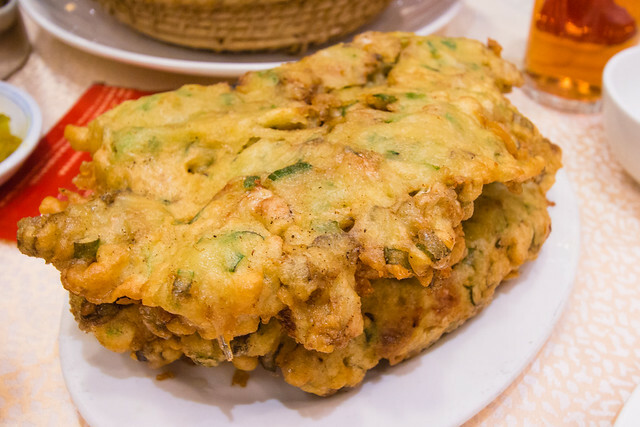 The Teochew style oyster pancake is thicker and greasier than the Korean and Taiwanese versions. The “appropriate” or simplified English transliteration of the above dish would be “Roasted Chicken”. However, the Chinese name dissected, tells you more about the dish. ‘燒鷄’ refers to preserved bean curd. ‘南乳’ is chicken. ‘吊’ means hang, which implies roasting. With all the characters put together, it becomes ‘chicken marinated with preserved bean curd, then roasted’. 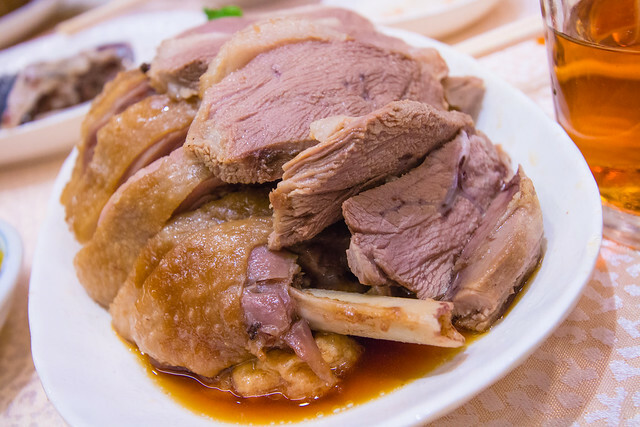 Teochew restaurants are easy to find in Hong Kong. I have yet to come across one that isn’t a noodle shop or Malaysian in the SF Bay Area. If you’re aware of one, please let me know! If you’re ever in Hong Kong or Southeast Asia, I highly recommend trying out Teochew dishes! It’s different than Cantonese cuisine, even though Teochew cuisine originated from the Chaoshan region within Guangdong.